A Very Happy Mothers Day to all you Mom’s out there. You deserve to be celebrated. 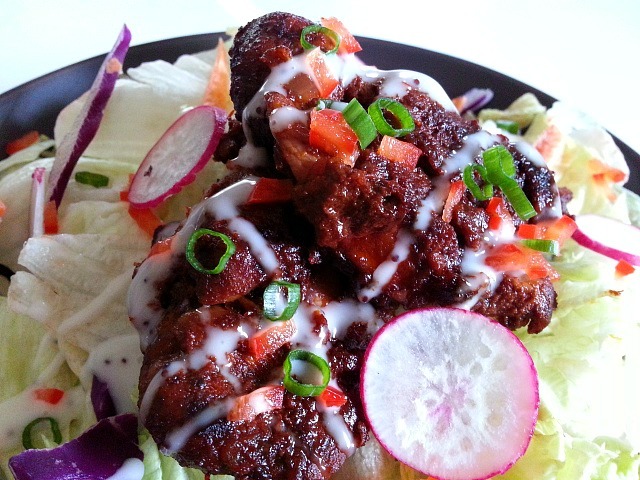 If you love braised meat and spicy then this is going to be your new favorite. Since Goan recheado masala is traditionally used with seafood it was a risk to use it with meats. My husbands regular out of the box cooking experiments, which at most times are successful just gave me the nudge I needed to experiment in cross-continent cooking(not sure if I sound right) but I am sure you get the point 🙂 . This recipe does not use wine but uses a red spicy curry paste made with vinegar and the meat liquid is used to braise the meat. I prefer bone in for added flavor of the bone and marrow but you can do boneless. 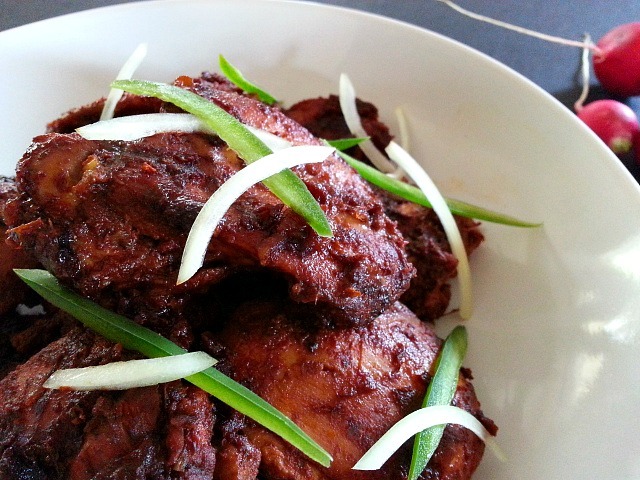 This spicy braised chicken has multiple uses. You can use it as a side, on a salad, lettuce wrap with a sweet sauce, sandwiches or for even a quesadilla. It is that good and just 3 ingredients! The best way to enjoy very flavorful meats is to marinate the meat overnight in the refrigerator with the spice paste, salt and sugar. Technically the longer the better. In a non-stick or cast iron pot saute the onions till soft. Next add the marinated chicken cover and cook for 20-25 minutes turning each side after 10 minutes each on medium low heat till the meat is soft, dry and slightly browned. If your chicken does not give out much liquid as mine than add 1/2 cup water. 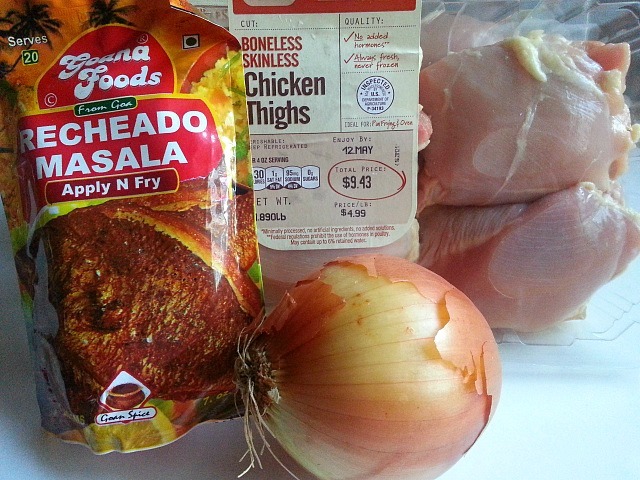 This recipe also works well for grilling chicken. Oh Wow! All I can say is “Lucky You” 🙂 Have a wonderful trip! This looks so yummy! Thanks for stopping by and leading me to your blog. Will definitely be trying out some of your recipes. Ack! My wordpress reader has a habit of randomly unfollowing the blogs I like 😔. And I never find out for days or weeks. No wonder I’ve been missing delicious posts like this one! Thank You Rod so much. I did notice the multiple follows and was wondering what was going on. Thanks for the note :-). Please Loretta let me know when you do give it a try. Would love to know what you think :-). I think the marrow from the bones adds a subtle flavor to the dish. Omg this looks so good! I’m going to have to order some Goan spices soon. I don’t think I’ve ever had Goan food, but plenty of Indian here in California. Where are you? What spice blend do you recommend as the easiest to use or most versatile? Thank You, that is very kind of you :-). I am in Lakewood. The one spice that can be used for multiple recipes and almost replace garam masala would be the Goan Xacuti Masala a dry powder based spice. Hope this helps. Thank You Benji for the re-blog. That is very kind of you. You’re welcome. Have a great evening! Your images and food styling are outstanding. Great photos, Nandini! This looks so good! Your photos are beautiful and this looks delicious! I like that you provided other ideas for serving the chicken…I bet this would be fabulous in a wrap, like you suggested. And on it’s own too! No problem, I love what you have and I hope that you enjoy my blog also. Just starting off and growing slowly. Keep up the great work! Thank You so much Cheryl. Wishing you too a very Happy Mother’s Day. Have fun and a great trip. It’s a lovely colour. It looks so full of flavour. Thank You Corina 🙂 . It does have a lot of flavor and medium spice. Thank You Van 🙂 . 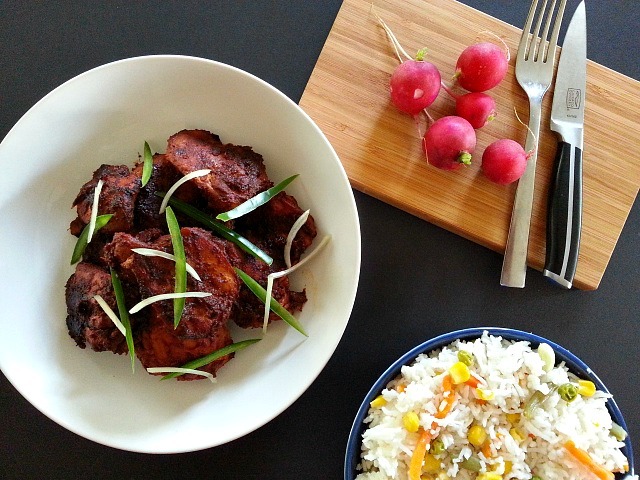 Spicy braised Chicken with a Goan twist looks stupendous. I think this Goan dish is a GEM of a dish. And RECHEADO MASALA is magic.Your photos look spectacular. I think Goa has a lot to offer to the catering industry. I feel the Goan dishes would be every chefs delight, without a shadow of a doubt. 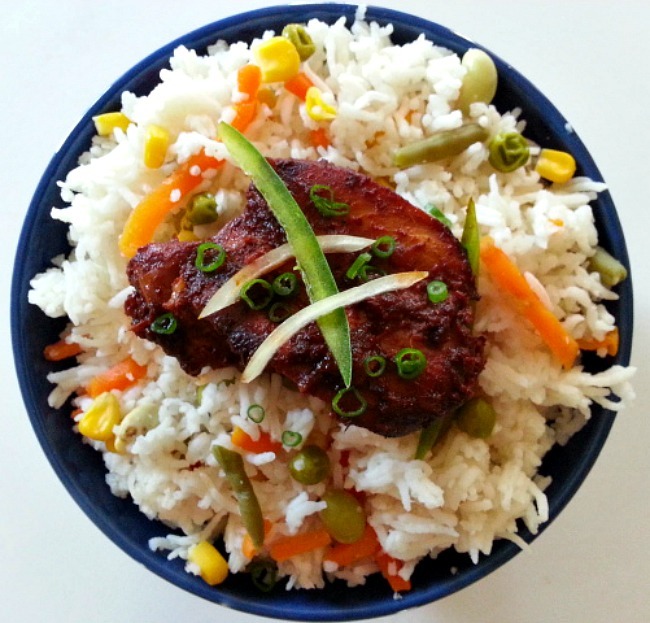 You put in alot of effort to bring out the best of Goan nosh (cuisine). I for one is fed up of chicken. But Your spicy braised chicken, has made Me think again. There is so many ways to cook chicken. I must say this,You are a walking encyclopedia of Goan.Cuisine. I feel ECSTATIC about Your recipes. It makes Me feel nostalgic. You are doing Your bit for GOA. Providing Goans and the rest of the WORLD with the best of Goan Cuisine. Thank You so much Mr Stan. Your words are always so encouraging. I do try my best. You sure are right with regards to Goan cuisine. It is a chef’s dream as they mix well with any other cuisine. I think blogging about Goa has benefited me the most as I realize a lot of the recipes are getting forgotten and since I have 2 boys hopefully I can pass on to them my food culture. You and Mrs Stan have a great weekend 🙂 . Happy Mothers day – wish your day will shine! Thank You Mihrank. You have a great weekend as well 🙂 . And if you are a Mother, Happy Mother’s Day…if not, never mind. You look way too young to have kids but one never can tell. Namaste Ms. Nandini. Thank you Juessepi for the wishes and the complement . I have 2 little boys under the age of 9 🙂 . Take Care. Enjoy your day. Hug those boys. Your photographs are very enticing and it is hard to believe this flavorful dish has just 3 ingredients! I’d love some please! That is so good to know Freda :-). Then I am sure you will enjoy this recipe.